There will be random character encounters throughout the map, with a lot of variety. Dynamic missions will allow for much more variety. Similar to Red Dead Redemption's "random world events". The AI has been greatly improved, you will see people waiting for the bus, gardeners doing their thing, and in general the pedestrian AI is incredible. The game will have dynamic music during missions. Sometimes in missions, the game will automatically switch to another character. Unlike in the previous games, the full game map will be open from the beginning with the exception of some restricted areas. There are multiple endings in the storyline depending on which choices you made in the game. Some missions will have money requirements. The game has a functioning ecosystem with a variety of wildlife. Just like in San Andreas, you can buy properties such as houses, garages, businesses and marinas. You can do flying challenges and stunt jumps, take part in golf, tennis, yoga, bike races and even triathlons. The in game phone actually takes pictures unlike the one in GTA IV. There are Mini Heists that are used to teach the player about preparation. Rockstar stated that there will be as much as five times as many pedestrians in GTA V as there were in GTA IV. An incredible amount of detail in the game world. New wanted system consists of 5 stars instead of the usual 6. You still try to escape from a circular zone like in GTA IV, but this time, you can actually hide somewhere while still in the circular zone because the cops have a line-of-sight system where if they don't see you, they will no longer know where you are! This is a HUGE change from the previous GTAs where every cop had some sort of magical wallhacks and found you no matter where you hid! Character appearances can be customized, you can pick tattoos, get a haircut, buy new clothes, etc. Vehicles can be customized once again. 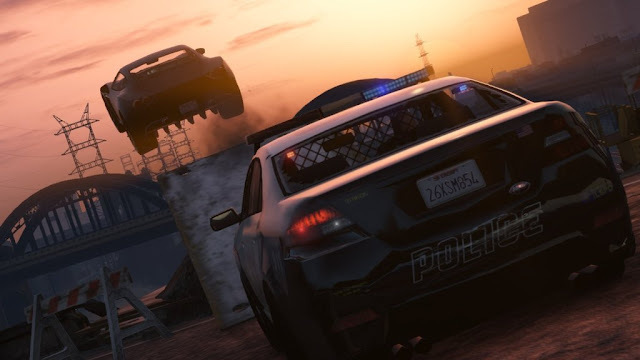 A similar customization system to San Andreas with a bunch of added features such as the ability to upgrade your engine, brakes and more. Weapons can also be customized with silencers, laser sights, extended mags, scopes, etc. Each character has a series of skill categories which include: Stamina, Shooting, Stealth, Strength, Driving, Flying, Mechanic, and Lung Capacity. You will be able to raise these skills and become stronger just like in SA. There are specials that are governed by a meter that drains after use and then slowly recharges.